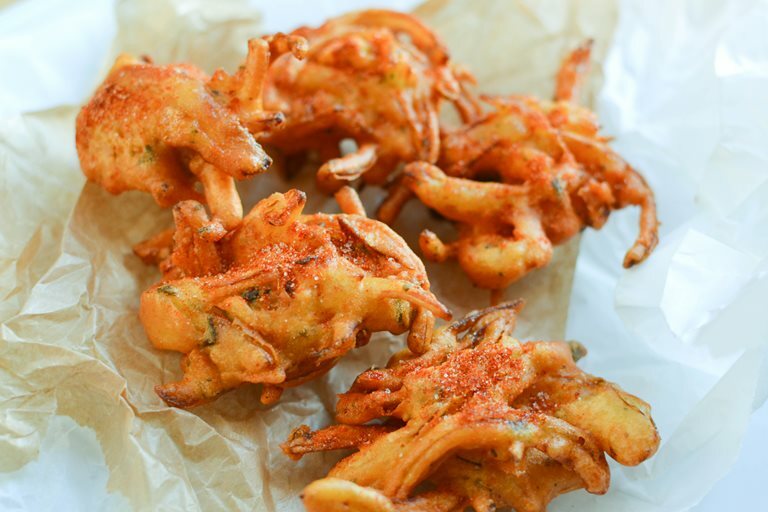 Onion bhajis are a superb addition to an Indian meal or great to have as a snack. Urvashi explains how these nibbles are part of bhajia family and how you can easily whip them up with the right store cupboard ingredients. Nibbles. They strike at all times of day. Mid-morning when you’ve had a super healthy breakfast but you need a little munch with your cup of tea. (Notice they never strike after a fry up?). Then around 3pm to satisfy the afternoon lag. Again this never happens if I’ve had a pub lunch. They mostly hit around 8 or 9pm. I’ve had a virtuous dinner but there is a craving for something more with my glass of wine. What I want is something crispy. Something fried. More often than not something spicy with a crunch. There must be a crunch. 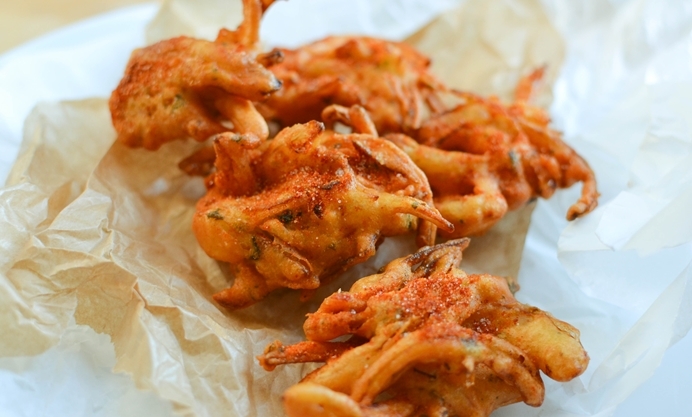 It’s for nibbles like this that we Indians created ‘bhajia’ – the collective term for a deep fried, crispy snack. You may also know them as ‘bhajis’ or ‘pakoras’. All part of the same family. In India, these moreish delights are sold on the street. Piping hot and drizzled over with chutneys of all sorts. They are cheap and fast. A winning combination. In my father’s town in Gujarat there are some bhajia sellers with queues of people waiting to satisfy their craving. Some of the best bhajia in India are sold on station platforms and indeed on the train itself. As soon as the train pulls into a mainline station, hordes of ‘bhajia-wallah’ will mount with their various flavours closely followed by the tea vendor or ‘chai-wallah’. It is truly the best part of the experience and the Ahmedabad station stop on the overnight route from Mumbai to Rajkot is one I would thoroughly recommend – but only visit the chap who sets himself up near where the second class sleep carriage pulls up. The others are average, oily and cold. My Mum’s house was rather like Piccadilly Circus when I was growing up. One family would pitch up un-announced to say hello because they were in the area. Then all would be quiet for a few hours before more people rang the bell. They would sit and chat and of course expect to be fed a cup of chai or two. Our family never serve chai on its own. It’s always accompanied by a nibble. On the weekends, my Mum would rustle up bhajia with whatever vegetables she had lying around – usually potatoes. The basic batter mix is chickpea flour (gram flour), spices and water. There are always plenty of those ingredients around. She’d serve these with chutneys or simply some plain yoghurt. I’m sure she made the really spicy ones for the guests she wanted to leave quickly! My job was to fry them and my sister’s job would be to run in and out of the kitchen serving them hot and crispy from the pan. They were too hot to steal en route but the batter goes a long way so we fried some up for ourselves when the guests had had enough. Bhajia batter is easy to make. I’ve adapted my Mum’s recipe below with a little rice flour which adds to the crunch. I’ve also added a sprinkled over ‘chaat’ topping which adds to the lickability. It’s well worth visiting your local Indian grocer for the ingredients. That’s it. Really quick and really easy! Happy nibbling! 3 green chillies, small, seeded and finely crushed. Use less or more, according to taste.